After water enters a home, conditions in the home plumbing system can affect the water’s quality. Bryan Municipal Utilities Water Department works very hard to be sure that the water leaving the treatment plant meets all federal and state standards. As consumers, it’s up to us to help protect that water quality by maintaining our homes’ pipes and faucets. Clean and disinfect sinks and drains regularly. Keep drains clear and unclogged. Use cold water for drinking and preparing food. Replace old plumbing and install certified “lead free” fixtures. Flush cold water taps after household plumbing work or when the water hasn’t been used for several days. Follow the manufacturer’s instructions for the water heater, filters, treatment devices, softeners and any other products attached to the water system. Do not connect hoses or other devices intended for non-drinking purposes to household drinking water faucets. Every home is required to have a main water shut-off valve installed inside the home during initial construction. So for most emergencies or repairs, shutting-off the proper inside valve will be our focus. There are also underground shut-off valves installed at the property line; if shutting-off this valve is necessary, please call our main office at 419-633-6100, follow the prompts if it is outside our main office hours. Home construction differs greatly; basements, crawl-spaces, and slab-on-grade. B.) 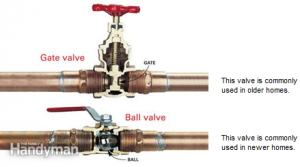 Slowly turn level handle valves ¼ turn, until the handle is not parallel with the pipe (90 degrees). It should stop at a ¼ turn. Between 1980 and 2000, America’s water use has more than doubled in some areas. In our town, conservation efforts by residents and local industries have helped keep water use steady. Currently, the Bryan Water Department pumps an average of 1.5 million gallons of water per day to the city at a rate of 2,000 gallons per minute. 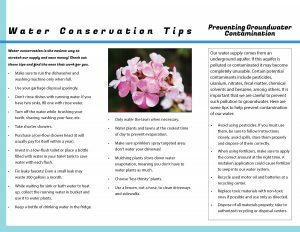 While we are fortunate to have a plentiful source of water, Bryan Water Department would like to encourage residents to conserve water. By saving water, we can also save money, energy, and the environment. ECONOMIZE – Become conscious of the amount of water you are using, and look for ways to use less whenever you can. REPAIR LEAKS – A leak of one drop per second wastes 2,400 gallons per year. Most leaks are easy to repair with a few simple tools. 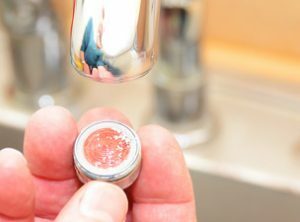 INSTALL WATER-SAVING DEVICES – There are many devices you can buy inexpensively or make yourself, such as aerators, flow regulators, and displacement devices. REUSE WATER – Used water is often suitable for other purposes. Make the most of any water before you let it go down the drain. Call a licensed plumber or the Bryan Water Department, 419-633-6100 during regular business hours if you have any questions.